Navigation: Home » Investing » Are Some Sectors of the Economy Still in a Recession? Are Some Sectors of the Economy Still in a Recession? Are there some sectors of the economy which are still in recession? So, yes, this post will mainly concentrate on sectors and be especially interesting to ETF and mutual fund sector investors… but investors of all stripes should internalize some of these concepts. Anyone reading this with an MBA (or, really, any keen observers of business practices) knows that for an individual company contracting or stagnating revenue isn’t necessarily a bad thing. Especially with things like consumer luxuries and technologies, it just doesn’t make sense for large companies to chase revenues in every corner of the market. Conclude with me: luxury brands don’t need to compete with the cheapest of imports. For sector comparisons, on the other hand, you better have a better conclusion. Is revenue leaking overseas? To new, smaller upstarts or private firms? Your answer makes a difference – this data comes directly from S&P and encompasses the 500 stocks which S&P chose to include in the index at the time. You’ve got some obvious high flyers, like Energy and Consumer Discretionary. And yes, I would have gone back further if I had the data (or if someone gave me a subscription to something like Morningstar or CapitalIQ, thanks in advance). A Better View of the Trend! We can adjust for inflation (CPI-U SA, I asked FRED to average it quarterly. Make an argument for non-adjusted, perhaps?). So, no, no annualized changes in revenues or anything. 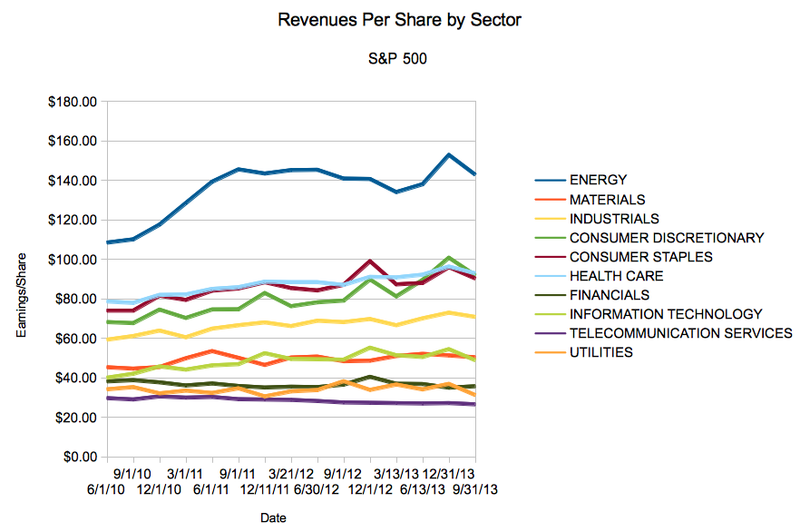 So, yes friends, this might be a story about pricing power – tech, energy, and consumer discretionary have been able to push their revenues up from 2010. Other sectors? Not so much. Okay, let’s open it up to audience participation, because the players we called out earlier have obviously contracted in revenue (but not necessarily in margins – but we’ll save that analysis)… and materials haven’t fared to well either. Full disclosure: I own VAW, the Vanguard Materials ETF. I don’t own GE or IBM. And, yeah, I’ve got plenty of S&P 500 in one form or another – but I’d be pretty flattered if that moved the market. Haha, just when you thought the US data was hard to find and cloistered… yeah, if there is a reasonable proxy I’ll take a shot. If you know of any sources that break it down, feel free to toss them over. The industrials graph line matches my completely unscientific, anecdotal evidence from my day job: cold calls from machine shops looking for work have been on the rise in the last six months or so. Haha, well… I’m sure it was more than n=1. 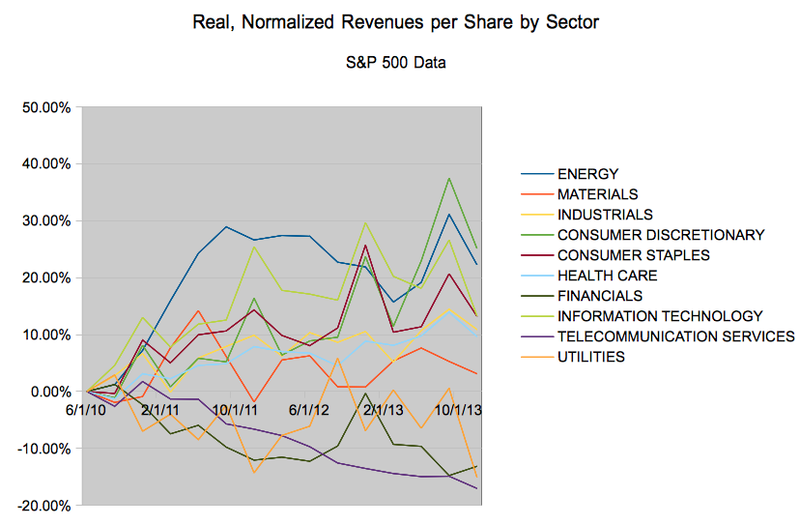 I was just surprised to see the disparity – there isn’t too much data out there on publicly traded company revenues, so I was happy to only go back a few years.